The name of Khan Kubrat first appeared in Byzantine chronicles in about 632 when his tribe, the Unogonduri, threw off the Turkic oppression. He succeeded in uniting the Bulgar tribes in the lands north of the Caucasus, between the Kuban, the Sea of Azov and the Black Sea. For about three centuries the Bulgars roamed the steppes of today's Romania fighting with the neighbouring nomadic tribes. Huns, Khazars, and Turkic peoples invaded the lands of the Bulgars. And the Bulgar flag, a horsetail on a spear, was often seen cutting into enemy ranks during their raids into Byzantium in the Balkans. 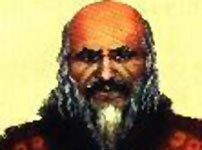 Khan Kubrat was the first to put a stop to the carefree pillaging of barbarian raids. This Bulgar chief from the House of Dub felt vaguely that in such crucial times the Bulgars were in need of unity. With foresight, patience and a statesman's will he laid the foundations of a military and tribal alliance. Its capital was Phanagoria on the Taman Peninsula. Byzantine chroniclers referred to it as Great Bulgaria. In this prototype of a medieval state Khan Kubrat tied kinship and tribal chiefs' ambitions into an involved but historically justified knot, creating the conditions for development and growth. With time the nobles came to understand the Khan's insight: only a state system similar to that of Byzantium might unite the Bulgar tribes. Kubrat made peace with the mighty empire and was awarded the title of patrician by Emperor Heraclius. With the title, accompanied by generous gifts, the basileus was hoping to keep the powerful Bulgarian ruler on his side. Peaceful relations with Byzantium allowed the Khan to defend the independence of Great Bulgaria against continual Khazar attacks. The state of Khan Kubrat, who is also mentioned as Kurt in the Name List of Bulgarian Khans, spread from the Kuban in the east to the rivers Donets and Dnieper in the north and west and to the Sea of Azov and the Black Sea in the south. There is a legend saying that as the Khan was dying, he ordered his sons to fetch a bundle of sticks and told them to break the bundle in two. When none of the sons managed to break the bundle, the Khan took the sticks and broke them one by one with his feeble hands. The sons understood their father's message: their strength depended on their unity. The Byzantine chroniclers Theophanes and Nicephorus wrote that Kubrat's bequest to his sons was to preserve the unity, "so that they would dominate everywhere and never become other peoples' slaves". The Khan died some time after 651 as a powerful and respected ruler. The five sons, however, went their separate ways and Great Bulgaria gradually fell apart. The firstborn son, Batbayan (Bayan), stayed in his native land and was soon subdued by the Khazars. The second son, Kotrag, founded a state in the confluence of the Volga and the Kam, which survived until the beginning of the thirteen century. Kuber led part of the Bulgars to Pannonia and settled in Macedonia. Altsek and his group of Bulgars reached Italy. The fifth son, Asparukh (or Isperikh), was elected to further the work of his father. He led one of the Bulgar tribes west to the Danubian delta where he laid the foundations of the Bulgarian state, which was to survive for thirteen centuries. By so doing, Asparukh fulfilled the bequest of his father. Khan Kubrat, the founder of Great Bulgaria. Text copyright © Rulers of Bulgaria, by Professor Milcho Lalkov PhD. Images by Tekla Alexieva, Buyan Filchev and Hristo Hadjitanev Published by Kibea Publishing Company, Sofia, Bulgaria.